These steps and pointers can help you take better control of your air conditioning and heating comfort and costs. Of course, the pros at Earnest Heat & Air are always available to share more detailed knowledge and guidance. Never underestimate the value of preventative maintenance on your cooling and heating system. In addition to improved safety, comfort and energy efficiency, regularly maintained equipment is less likely to require service. That can save you hundreds, even thousands of dollars in repair costs over the lifetime of your system. Considering all that’s at stake, keeping everything in good working order is simply the smart thing to do. 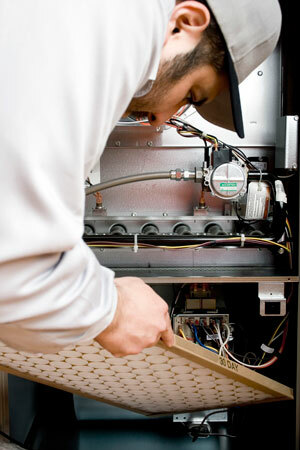 Call us to schedule a tune-up or learn about our annual maintenance agreements. To get the most efficiency out of your air conditioning and heating systems, make sure there are no leaks or cracks where inside air can escape and outside air can creep in. Check to see that you have proper insulation everywhere and seal up all windows and doors as needed with weather stripping or chalking. Along with maximizing comfort inside your home, this will help reduce your energy bills because your system won’t have to work so hear to overcome the inside/outside air seepage. Still using that old thermostat? Think about purchasing a new programmable model. It will let you better control your energy use and maximize your comfort according to the weather and your schedule. A programmable stat is a valuable resource for people who are away from home for set periods of time during the week. Now is the perfect time to get in the habit of changing your A/C filter on a monthly basis. A filter that’s become clogged with hair, pet dander, mold, pollen, dust, or any number of pollutants and particles puts a strain on your cooling system and spoils the air your family breathes. Change it regularly and enjoy a fresh flow of clean air and savings. Is your home too humid? Your air conditioner could be to blame. A system check by one of our pros can help increase comfort. You can also get your home’s humidity and comfort under better control with a whole house dehumidifier. Call us for details. You can keep your home more comfortable and reduce A/C costs this summer by installing energy-efficient ceiling fans to circulate the air. The average cost to run a fan is only about $7 a month and it can make a big difference in creating a breeze effect that feels cool on the skin. Your cooling and heating system ensures comfortable year-round temperatures inside your home. Over time though, systems can begin to lose efficiency and break down more frequently. If yours is more than 10 years old, the U.S. Department of Energy recommends you have it inspected by a qualified air conditioning professional. We can come out and assess your current equipment’s overall condition and efficiency and determine if a new ENERGY STAR rated system can reduce utility bills and produce a higher degree of comfort for you and your family.